On-Track Tutoring (OTT) provides a full range of educational services, with the mission of empowering students of all abilities with the skills they need to attain academic success. We have provided Scottsdale, Paradise Valley, and the Phoenix Metro area with one-on-one private tutoring and academic support services since 1999. We take great pride in offering an exceptional experience that starts with carefully matching each student to the right tutor, working as a team to monitor and assess progress, and ultimately, achieving academic success through proven and effective teaching and study strategies. We are well-known throughout the Valley in Arizona for supporting students of ALL levels and abilities, from the pre-primary grades through college in all subject areas as well as Test Prep, Executive Function Skills Training, Study Skills and Organization, and a variety of research-based Multisensory Reading Intervention Programs. Join OTT/JGS this fall: Study smarter, increase your score! 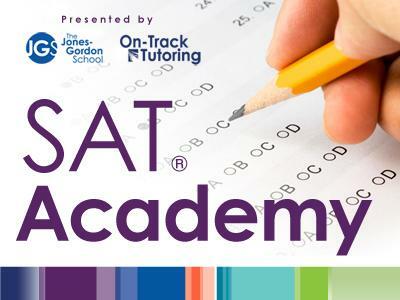 Download an SAT Academy fall 2018 flyer! Register online by Fri, Aug 31! How have we been successful for so long? We offer our clients a winning combination of undivided attention, collaboration, flexibility, convenience, privacy, and proprietary programs that translate students’ strengths into tools for academic and life success. A team of tutors who share our enthusiasm for inspiring a passion for learning and growth is key to our success, too! On-Track is A Division of Herzberg Educational Services, Inc.
Herzberg Educational Services, Inc. (HES) is a rapidly growing Scottsdale, AZ organization that includes On-Track Tutoring (OTT) and The Jones-Gordon School (JGS). On-Track Tutoring , established in 1999, provides home- and site-based tutoring and academic support services to individuals and families. OTT programs are individualized to meet each client’s needs and empower students to discover their strengths and achieve results. Founded in 2010, The Jones-Gordon School (then called On-Track Academy) is a private day school for diverse learners in first through 12th grades. Both organizations employ Dana Herzberg’s proprietary programs: Foundations™, a study skills and organization program that provides students with tools and strategies required for long-term, independent academic and life success; and Strategic Connections©, a comprehensive executive function skills program.